Benzene is a colorless, flammable liquid that is produced naturally by volcanos, fires, crude oil, gasoline, cigarette smoke, and through human activities. According to the CDC, benzene is one of the top 20 chemicals utilized in the production of various products and materials in our country. Unfortunately workers exposed to it risk suffering life-threatening diseases like leukemia and other cancers. Anemia. This can be caused by a decreased red blood cell count, resulting in him feeling tired and weak. Low white blood cell count. If a person has a low white blood cell count, he can experience a weakened immune system and face an increased risk of infection—sometimes with fatal results. Low blood platelet count. If a worker suffers with this, he could experience excessive bleeding and a tendency to bruise easily. Irregular menstrual cycle. Women exposed to high levels of benzene could find that their monthly menstrual periods become irregular, and their ovaries could decrease in size. Cancer. If a worker is exposed to high levels of benzene in the air, he could develop cancer, such as leukemia and cancers in blood-producing organs. Victims of benzene exposure need immediate medical treatment. Unfortunately, there is no antidote for benzene poisoning. They will also need long-term expensive medical treatments for the medical conditions—like cancer—that result from the exposure. 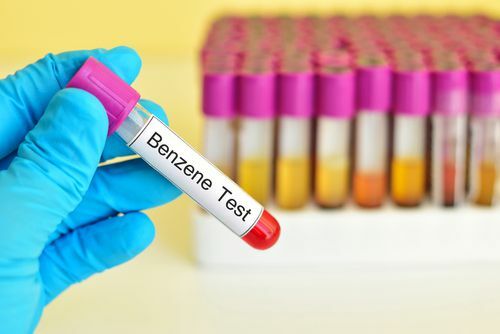 If you were exposed to benzene at your job, you could be entitled to workers’ compensation benefits for your medical treatments and lost wages. Fill out my online form or start an online chat today to schedule a free consultation to learn how I can assist you in getting the compensation you deserve.